Magento comes packed with several product types: simple, grouped, configurable, virtual, bundle, downloadable. Sometimes clients request can reach beyond any of these built in product types functionality. In such cases, usual way of handling things is throwing some new attributes and hooking into some events from which you can handle and “re-route” certain logic. In some cases, the required product logic can extend to such level that you are better of with building a new product type in Magento. Why, you might ask? Becase of the more finer control you can achieve on product trough your own models than to poke around on the existing stuff. Attached to this article is a fully working extension I wrote that creates a new product type in your Magento store. This new product type uses code name “customproduct”. Its based on the Mage_Catalog_Model_Product_Type_Abstract class, the one on which the “simple” product is build upon. Unlike “simple” product type, this “customproduct” does not have any, whatsoever, additional logic built in. This, I leave to you. 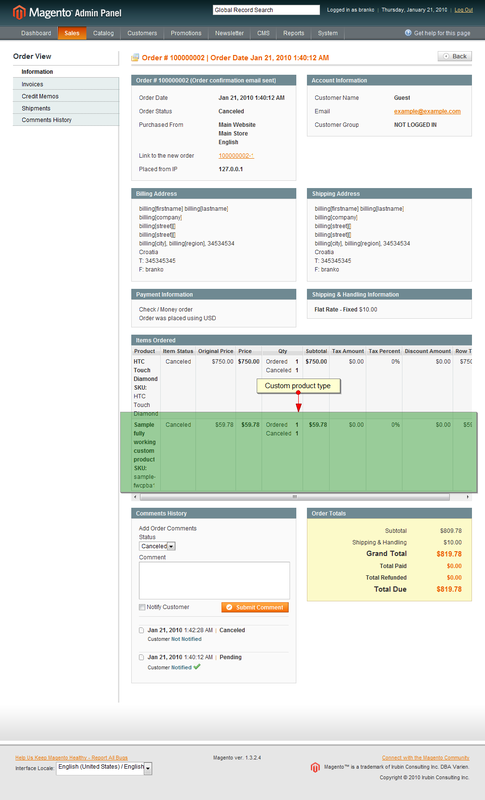 Also, extension comes with several “hooks” to certain Magento controllers actions. If you open the app/code/local/Ajzele/CustomProduct/Model/Observer.php you will see implemented several “blank” methods as hooks. Going to config.xml file of this extension will show you what these methods “observe”. Here are few screenshots of how this looks like on frontend and on backend. 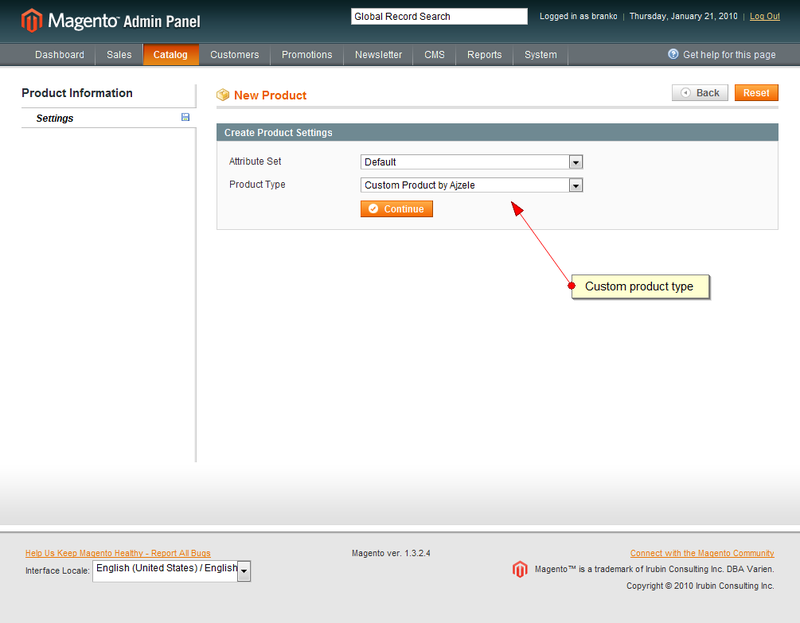 And here is the module (extension), Ajzele_CustomProduct. Note, DO NOT INSTALL the extension on LIVE SITE. 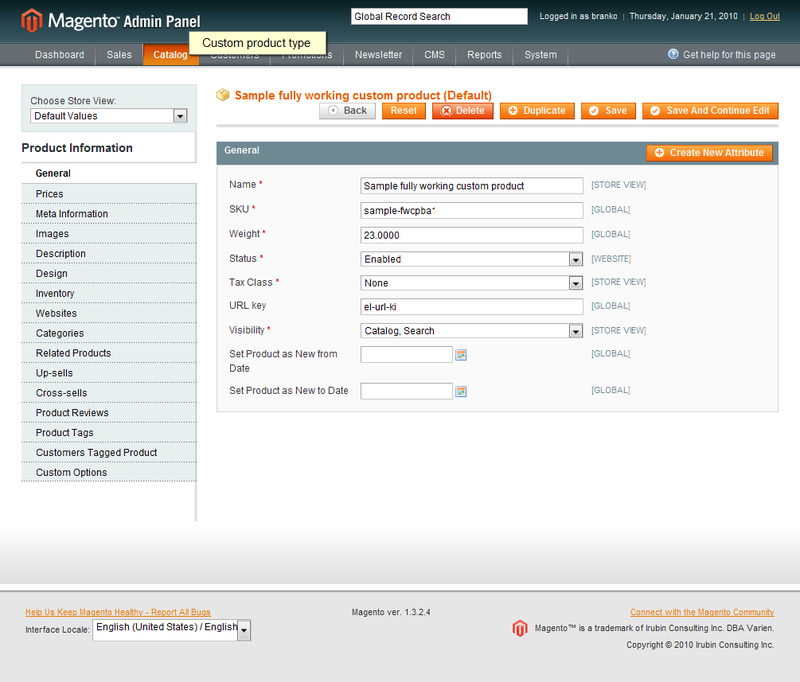 Use it merely for development testing and getting to know Magento product types. Extension is tested on my PC, latest Magento 1.3.2.4 version and it seems to work fine, both in admin and frontend. It is by no means intendant to be used on live site. Use it at your own responsibility. Have you developed this module compatible with Magento2? Check the date of this post and then check the date when Magento 2 was first announced. Custom product type. i want remove shipping address and shipping method. can any one explain me. I am looking for based on bundle product , i created new data type but in admin panel can not get any associate or bundle product button. It’s a great guide… based on this custom product type I have created product with custom attribute, the products are getting listed but how can I show the custom attributes based filter in layered navigation. As of now only able to display default product type attribute based filter on layered navigation. Pls suggest way to include custom attribute in layered navigation for these custom product type. I installed the extentsion to Magento ver. 1.9.0.1, but nothing happens. Any advice on how to get it working with 1.9.x.x versions? I want to know is it possible to IMPORT products via CSV file for custom product type ? Or the script you provided is capable for handling default import/export tool functionality of Magento ? If NO, then please let me know how can i achieve this ? Actually I want to do the same as Tihomir Panchev. Does anybody knows solution for this? Hi! thank you very much for this post! 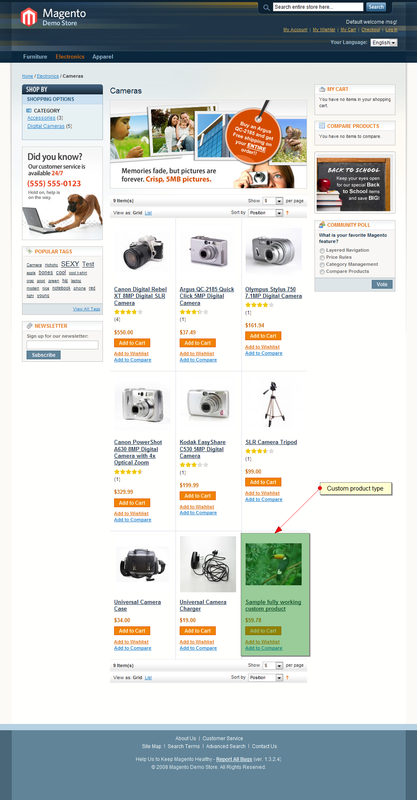 I am wondering, is it possible to delete price section from catalogview for this product, without changing other products? I want to create something like Showroom, where would be only images and description. with a fixed discount price. But the build in one (group product) can’t. I am looking for based on group or bundle product , i created new data type but in admin panel can not get any associate or bundle product button. How can make it configurable product type. On 1.7.0.2 its works, from create product to place order. I need to build a custom product which should be based on ‘gift card’ product type. Can you pls let me know what all additional codes I have to add to build the same? You saved me a lot of research time and other stuff :). Thanks Branko! I just used this in a project! Great stuff. But how do you make renderer for the product so it shows in sales object? I’m looking for a way to create a new product type based on the grouped product too, but with the abilty to group configurable products. Any ideas how to extend the grouped product type? Could anyone please help me out here or atleast give me a hint!! ?? Thanks for the extension. But I was wondering if there is anyway to make customized product type based on the ” Grouped ” type product? If there is could you tell me how can I set that up? I appreciate any kind of help. its is something to understand in depth for programmer and you make it available …you deserves many many thinks….. Suppose I want to add an upload file-field to a custom product-type, how would I do this? Thanks for a great module by the way. My pain is that I want to customize the system fields… What I mean is to remove some of the system attributes e.g. price, stock, qty, add to cart and etc. 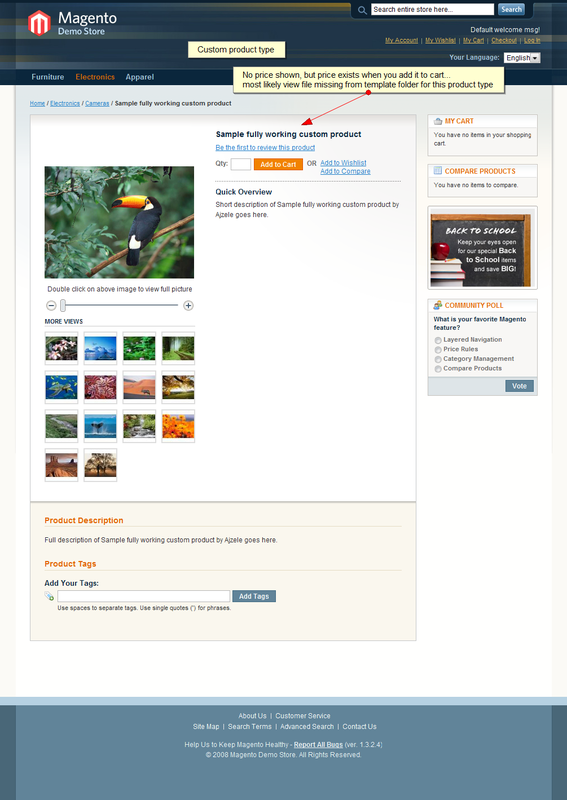 and to make the product looks like an article: Title, description (short), thumb, images etc. No price, no additional stuff in it. Is it possible to do it with your extention? If yes,.. how..
It’s a very interesting article ! Do you know how to add some tabs with specific informations linked to our new product type? ok. now i understand. The fact this code creates a new product type means we can have the additional logic embedded in this product type. This is just what i was looking for. Wanted to copy & make some changes to the bundled product type. This will come in handy at learning Magento. Just started looking into it yesterday, but i soon learned it has serious drawbacks when it comes to price calculation based on chosen attributes. This is how our team plans to use it (not sure if we can or not, though) … for example we have a product that simulates a theater booking system. In addition to the attributes, we have specific code within the product. Every time we need to create a new theater event, we have to duplicate a product. Now, if we can create a new product type and embed in it our code, then we can simply create a theater event as opposed to duplicating the original product. Couldn’t you just create a new attribute set to accomplish? What did you use this for, specifically? The zip file seems to be invalid. Could you fix it please? Scratch that last comment. Somehow I looked past the same unclosed node like fifty times. All seems well now. I went through config.xml adding nodes one by one until I could get the error to repeat and seems to be caused by the catalog node. Do you have any more insight into what’s causing this? This specific product in the example is not that different from Simple product type. However, it enables you now to do any custom logic in the model that will make it a whole lot different then any product type in Magento 🙂 -For example, if you use “duplicate” function a lot I would guess you are using it in order to “presetting” some values for product so you do not have to fill them in each time manually. 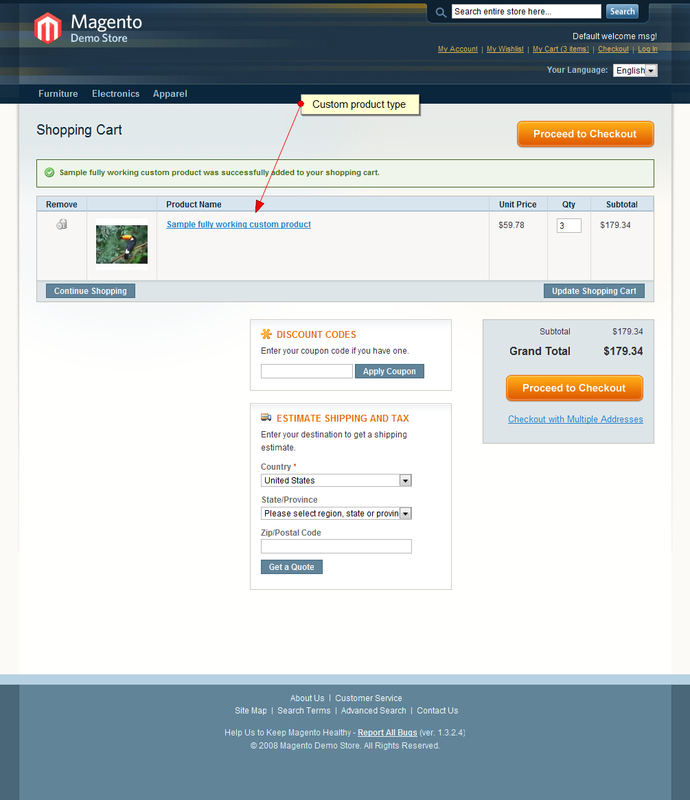 Why not do so with the code in your custom product type?! Just a thought. We customize the hell out of our products! … i am not a coder, but i like to learn about what is happening in the development world so i can keep my coders “honest” and get ideas for us. But, a question just so i can understand and talk with some “authority” with my coders, how is this product different from a simple product? i can’t read php to save my life and the tabs seem similar to what one would usually see in a simple product. Thanks for this. This would really be great in testing new products. I’m also following your note; not using it on live site. We’re trying to develop a product type of “schematic”, which is similar to a grouped product, but needs reference numbers and quantities for each part that goes to the product listed. Using this, it should be much easier. Thanks. This post is impossible.. to ignore..coz.. 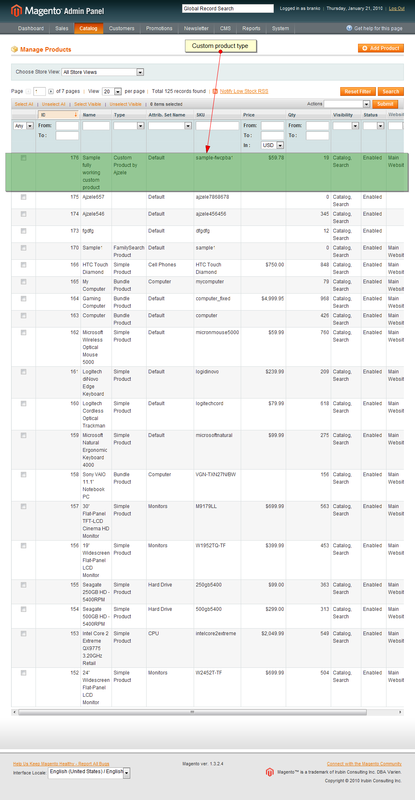 I can learn from this.. about Magento’s ins and outs :D.
There are tons of scenarios one might need custom product type, such as more finer control over “live products” that are pulled via some feed from some third party service or etc…. For all those who do not “understand the need for custom product” type, answer might be brutal but simple, please ignore this the article and attached extension. In short, consider yourself lucky if you won’t need to create a new product type ever. I dint understand the need of this. Let me clear my point. I think, we can just use Simple Product Type always. Kindly give us an example of a situation, when you may need this. Im sure, you would have come across any client’s requirements and thats why, you would have done this and just wrote this . So, let us know that situation.